Got a little boy and feel like you can’t exercise your true shoe-buying potential for him? We have the exclusive on a funky new-to-Australia range that’ll solve all those shoe-buying woes. In fact, we challenge you to stop at just one pair. The Keep collection is based on cool, comfy shoes with splashes of colour and patterns. There’s the Guerra style – spunky little high tops with check-patterned heels – and Ramos, a pared-down version of the high tops, equally cool and manageable for little feet. The Benten boat shoe makes me sigh in the particular way reserved for fabulous shoes. The Bentens are seriously cute, with authentic details such as moccasin whipstitch and side lacing. It’s the spectacular, bright colours that win me – style an outfit around green or royal blue shoes and I bet your little boy will get some serious looks of envy. 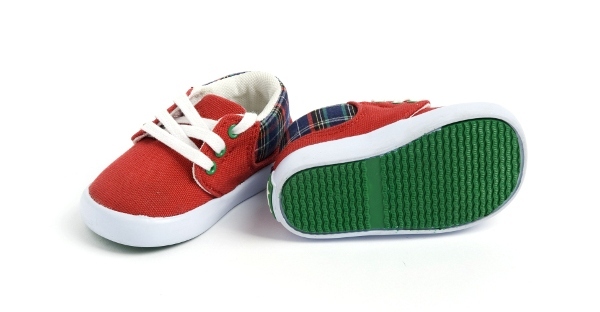 Keep kids shoes have either hidden elastic for ‘slip-on-ability’ or simple Velcro fastenings. Keep shoes are available in Australia exclusively from FunkyBaby for $59.95 a pair. Sizes range from approximately seven months to two-and-a-half years. FunkyBaby are giving away a free pair of kids’ sunnies, while stocks last, with every purchase of Keep Shoes.